Every summer I go to the lake for two weeks with my whole entire family. I thought I would share some of my essentials for days at the lake. Sunscreen: Neutrogena Sensitive Skin Sunscreen- Of course Sunscreen is a necessity for the lake, because no one wants to get burned. I definitely recommend this Neutrogena sunscreen, because it works really well for my face. Sandals: Jack Rogers Classic Navajo Sandals in Platinum- You can't have any summer necessity post without Jack Rogers! These are my go to shoes no matter what I am doing, so of course they are perfect for the lake. Hat: Nordstrom Ribbon Weave Sun Hat- You want to keep the sun out of your face and a hat is the perfect way to do that! 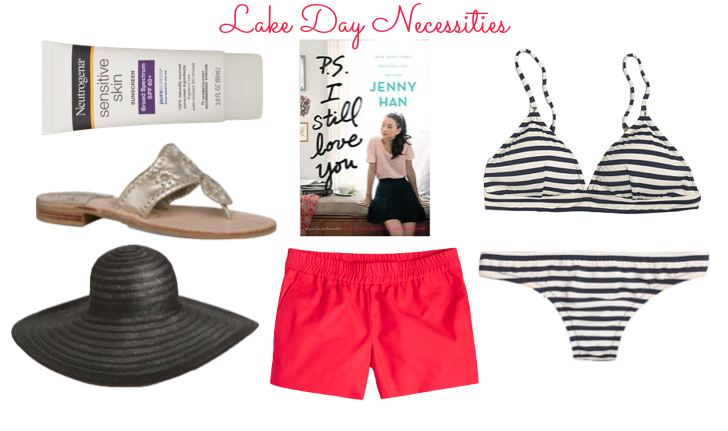 This hat is so perfect for a fun lake day. Books: P.S. I Still Love You- I just finished this book and it is so good! It's definitely a summer must read book just make sure you read the first book(To All the Boys I've Loved Before) first. I promise you won't regret it, but if you're interested in reading check out this post. Shorts: J.Crew Factory 3" Boardwalk Pull-on Shorts in Belvedere Red- You have to have some comfy shorts for when you want to change out of your bathing suit. These shorts are adorable and comfortable. Bikini: J.Crew Factory Sailor Stripe Bikini Top and Bottom- You need a bathing suit for the lake, but you want one that is comfortable, but still cute and I love this one from J.Crew Factory. Make sure to follow my social media to see all my adventures at the lake!